B.M.M.O. Consulting: When Does Marketing Become Unhealthy? When Does Marketing Become Unhealthy? The group WHO, which stands for World Health Organization, is taking a stand against childhood obesity. They do this by trying to reduce the marketing to kids of unhealthy foods and beverages. Forty-Two million children under the age of 5 are suffering from obesity; this is not only sad, but also dangerous. The health risks that are associated with carrying around extra weight are deadly. 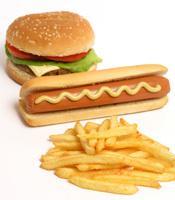 Per WHO, children's eating patterns are influenced by television advertisements of foods high in fat and calories. WHO has made a recommendation to the government that children see limited advertisements for unhealthy foods. A way this can be done is by monitoring the commercials advertised on children and teen specific television stations. "WHO believes that the governments must establish this act through the legislation of restricted harmful marketing practices directed toward children." Michelle Obama launched her plan to help fight childhood obesity back in May of 2010. She set goals that she wanted to see take place to help decrease the childhood obesity rates. She has the same views as WHO on the importance of positive marketing of food for children. While advertisers play a large role in what is put on television, it is also up to parents to do their part to monitor what they feed their children. We all play a part; lets all support the cause to raise healthy children!